Game description: The lives of the three valiant heroes are yours to command in this epic quest of good versus evil. A young swordsman named Darius, his childhood friend Ruyan, and a mysterious woman named Faeana embark on a quest to stop the mad wizard Darsul from destroying their homeland. To make matters worse, each character suffers from an evil sorcerer's curse that will kill them all if they don't find the cure. Now, you must use each character's special skills, combo attacks, and weapons through the ruins of an ancient civilization in the effort to save their land and their lives. 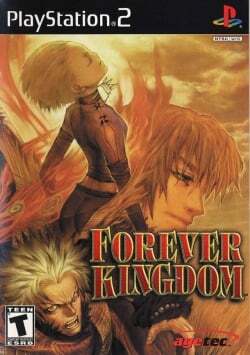 Forever Kingdom takes place directly before the events of Evergrace. Darius lived a somewhat sheltered life with his parents in the small village of Solta. Though not having any siblings, Darius was very close to his friend Sharline, whom he cared for like a sister. However, Darius' simple home life in Solta would come to a tragic end when assassins hired by the secluded village of Morea murdered Darius' parents for unknown reasons. In addition to facing the loss of his family, Sharline was nowhere to be found, leaving Darius with the conclusion that she was also killed. USA v02.20(10/02/2006), A little agressive game for any cpu/gpu. Description: Skybox is either incompletely rendered (NTSC-U) or glitchy (NTSC-J) in Hardware mode. Description: Certain objects, such as gates, have missing textures in HW mode and only have parts of shadows rendered on top of them.